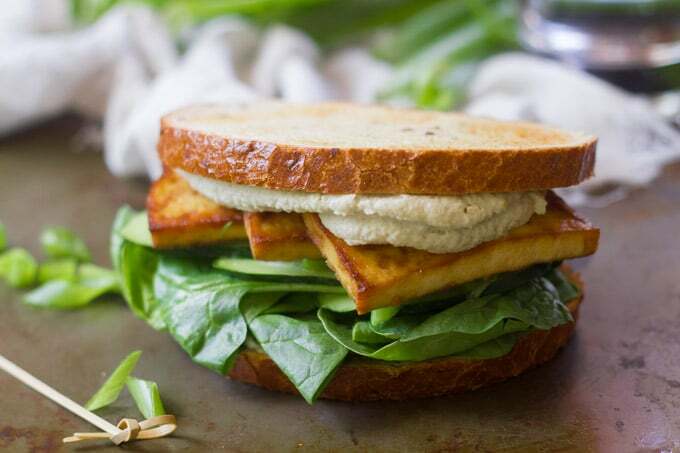 Baked tofu sandwiches with Asian flavors! These scrumptious sammies are stuffed with smoky baked tofu, crisp veggies, and slathered in kicky wasabi mayo. Packed with flavor and great for meal prep! This entire sandwich was pretty much created around wasabi cashew mayo. Once I got the idea for that stuff in my head I got into I need to make this now mode. This was my second attempt at wasabi mayo sandwich, the first being something I’d planned on calling a “sushi sandwich,” which was pretty much just sushi veggies and wasabi mayo on toast. It was fine, but I was so enamored with the idea of wasabi mayo that “fine” just wasn’t gonna cut it. Also, since doing that I’ve discovered that sushi sandwiches are a thing, and not what I had created. I gave it some thought and decided smoky baked tofu sandwiches would be the perfect vehicle for wasabi mayo. I was right! The sandwich did not taste like sushi. This sandwich did taste like awesome. Best flavor combo ever! And even though I consider smoky tofu to be the perfect complement to wasabi mayo, I’m betting you’re going to want to put cashew wasabi mayo on everything from this day forth. Let’s talk about baking tofu! For these sandwiches I wanted tofu you could sink your teeth into. Baked tofu is very teeth-sinkable. It’s also super flavorful. You press it before baking to squeeze all the flavorless tofu water out, then marinate it to replace the liquid with flavor-packed goodness. Once your tofu has soaked in the marinade for a bit, pop it in the oven and bake until it darkens up and becomes dense and chewy. Seriously, if you ever meet someone who tells you tofu is bland, bake them up a batch of this stuff. You’ll have a tofu addict on you hands pretty quickly. While the tofu bakes, blend up some raw cashews, lemon juice, and wasabi in the food processor to make your mayo. 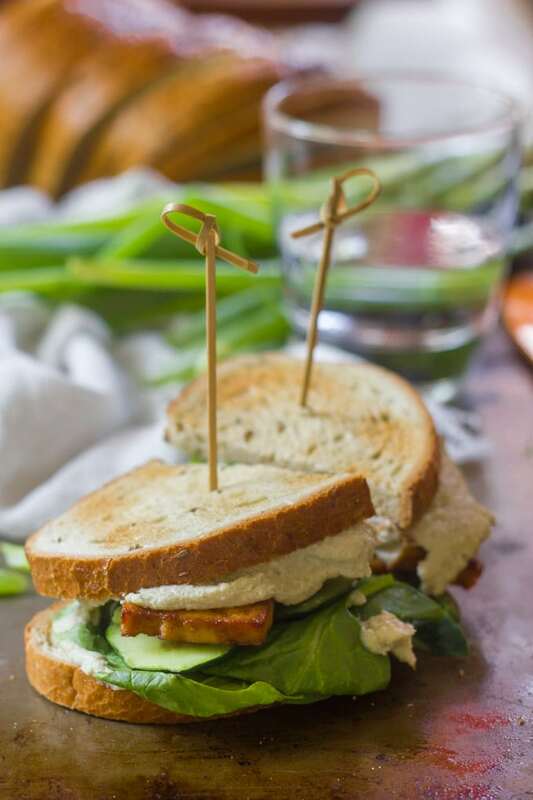 Layer everything on your favorite sandwich bread with cucumber slices, scallions and greens. 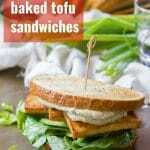 Baked tofu keeps for about 3 days, so you can make a big batch ahead of time and assemble the sandwiches when you’re ready to eat if you like. Store the tofu in a sealed container or bag. The wasabi mayo will also keep for about 3 days in a sealed container. It’s also freezer-friendly. Go as heavy or light as you like with the amount of wasabi in the mayo. If you’re not sure how much you can handle, start with a small amount and add a bit at a time. You can also, of course, skip the wasabi if you’re not into it or want to make the sandwiches more kid-friendly. Whisk the soy sauce, vinegar, maple syrup, sesame oil, liquid smoke, ginger, and garlic together in a small bowl. Slice tofu into 1/4 inch thick slabs and place it in a shallow dish. Pour the soy sauce mixture over the tofu. 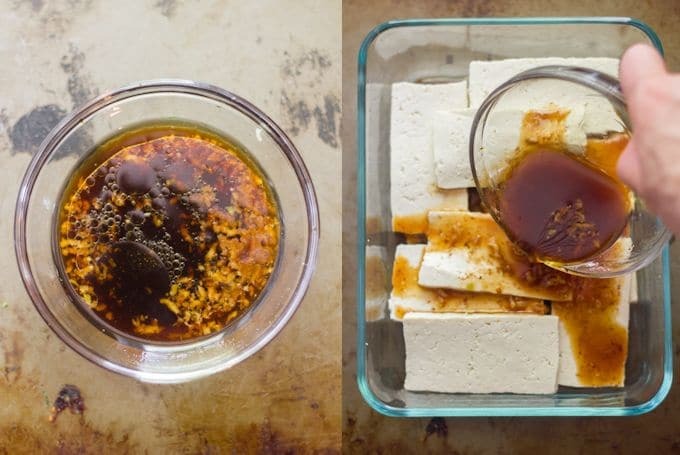 Allow the tofu to marinate for at least 30 minutes, turning once or twice to recoat all surfaces. 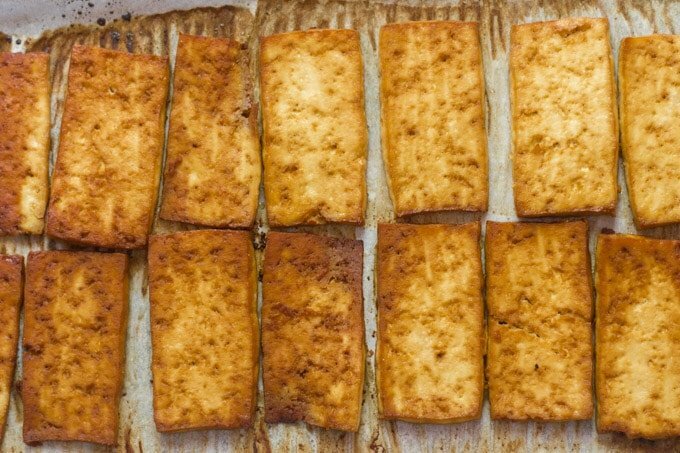 Line a baking sheet with parchment paper and arrange the tofu slices on it. Bake the tofu for 40 minutes, gently turning once about halfway through cooking, until it darkens and shrinks up a bit. You can also brush it with any excess marinade when you turn it. 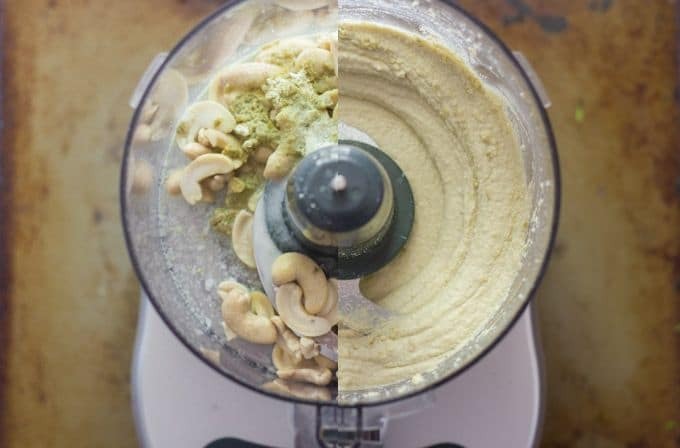 While the tofu bakes, place the cashews into the bowl of a food processor fitted with an s-blade and blend them to a thick paste, stopping to scrape down sides of bowl as needed. Add the lemon juice, wasabi, and salt, then blend again. Thin with as much milk as needed, and blend once more until the mixture is smooth and creamy. 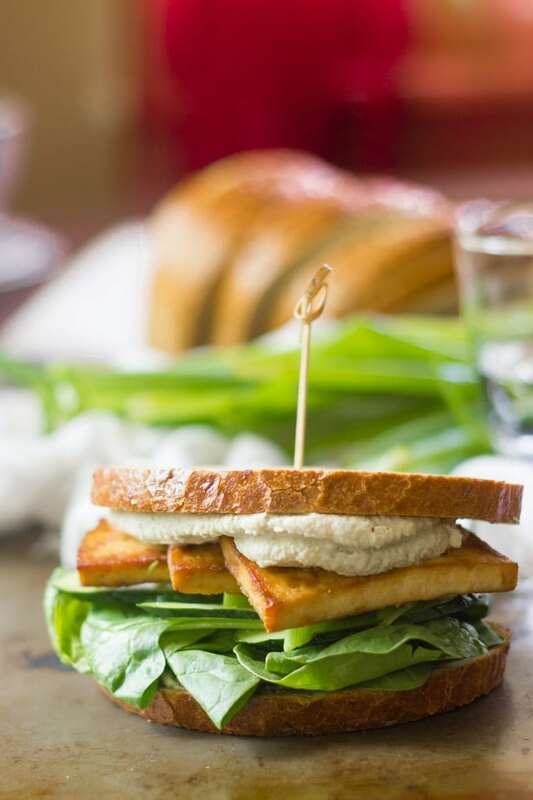 Slather one side of each bread slice with the wasabi cashew mayo, then pair up the bread slices stuff with the baked tofu, spinach, cucumber slices, and scallions. Drizzle the veggies with rice vinegar and sprinkle with salt and pepper. I never quite understand the use of “Asian” as a descriptor. Perhaps Japanese influence due to the wasabi here? I mean Asia is quite a large place with a lot of flavours and it doesn’t really describe anything on its own. Also, that wasabi powder isn’t great. You’re better of just using fresh horseradish (as it will be highly unlikely (and very expensive) to get fresh wasabi) as it’s ultimately what you are using in dehydrated form. I tried it with horseradish instead of wasabi and salad instead of spinach. It was sooo delicious! Alissa, because if you I can’t get enough of tofu and eat it nearly every day. Thank you so much for making that present to me.